Read for This Week’s Study: Ps. 19:7-8; Exod. 23:1-9; 1 John 5:3; Rom. 3:19-20; Exod. 20:11-12; Deut. 5:15. Memory Text: “Now by this we know that we know Him, if we keep His commandments. He who says, ‘I know Him,’ and does not keep His commandments, is a liar, and the truth is not in him” (1 John 2:3-4, NKJV). Key Thought: God’s entire moral law is what reveals our sin and, thus, our need for a Savior. The law and the gospel are, therefore, inseparable. The law and character of God are central to the great controversy and, when the controversy is finally over, God’s law and character will be vindicated before the onlooking universe. Until then, the controversy rages on, and as human beings we wind up on one side or another, and the side we choose decides which master we follow. In the words of Bob Dylan, You’re gonna have to serve somebody,/ Well, it may be the devil or it may be the Lord/But you’re gonna have to serve somebody. Those who choose to serve the Lord do so out of love and appreciation for what has been done for them through Christ. Having been buried with Christ by baptism into His death, they know that the body of sin was destroyed so that they no longer need to serve their former master, sin, but now have been given the freedom to obey God and His law. In this week’s lesson we will look at the nature of the law, its purpose, and its relation to the good news of God’s saving grace. For, rightly understood, God’s law helps to reveal just what God’s grace has offered us in Christ. *Study this week’s lesson to prepare for Sabbath, December 8. The word torah is a commonly used Hebrew word in the Old Testament and is often translated as law. The New Testament uses the Greek, nomos, (law) to translate torah. Torah means 'direction' or 'guidance'. Because the Bible is a record of God’s relationship with humans, law in the Bible generally refers to all of God’s instructions to His people. Because God Himself is good and righteous, and guides and instructs His people in goodness and righteousness, we rightly assume that His law reveals His goodness and righteousness. Or, as we like to say, the law is a reflection of God’s character. It is by way of the Bible that God has explicitly revealed Himself to humankind. As one reads through the sacred texts, one comes across an abundance of materials that are, basically, directions or instructions that cover many aspects of human life: morality, ethics, health, sexuality, diet, work, et cetera. Some of these instructions are clearly universal; others appear to be more limited in time and scope. But because all of them are God’s instructions (torah), the greatest care is needed in the development of principles that help us to understand what is universal and what is limited. Seventh-day Adventists and many other Christian groups generally make a distinction between 'ceremonial' laws (regulations that teach the plan of salvation by symbols and ritual practices), 'civil' laws (instructions regarding the community life of the nation of ancient Israel), and 'moral' laws (instructions of God’s pattern of conduct for humanity). Most Christians claim that the Ten Commandments are God’s universal moral code. This view is seen, for instance, in various legal battles in the United States, in which Christians have sought to have the Ten Commandments posted in various public places, especially public schools. Years ago, Alabama was involved in a legal battle involving a state judge who refused to remove a monument of the Ten Commandments from a courtroom, despite orders from a higher court to do so. In the minds of many, the Ten Commandments, far from being invalidated, remain God’s legal standard for morality. And with good reason too. To begin with, although the Decalogue (the Ten Commandments) was codified at Sinai, the book of Genesis suggests that most of the commandments were known before then. What do the following texts reveal about the existence of the law prior to Mount Sinai? Gen. 35:1-4, 2:3, 4:8-11, 39:7-9, 44:8, 12:18. On logical grounds alone, it makes no sense for the Ten Commandments to have been purely a Jewish institution, something intended only for a particular people in a particular time and place. Doesn’t it make sense that moral issues such as stealing, killing, adultery, and idolatry are universally wrong, regardless of culture? Also, when the Bible is so clear that sin is defined through the law (Rom. 7:7), the notion of the law being abrogated or superceded is, on the face of it, an incoherent position for any Bible-believing Christian. How does James 2:11 help us to understand the perpetuity of God’s law? 1 John 5:3 says that obedience to God’s commandments is an expression of our love for Him. What does that mean? Why is obedience to the commandments an expression of this love? Though many understand that the Ten Commandments remain binding in the lives of Christians, the role that they play in the plan of salvation can get confusing. If we’re not saved by the keeping of the law, then what is its purpose? How do the following texts help us to understand the role of the law in the lives of those who are saved by grace? The law was never designed to be a means of salvation. Through the working of the Holy Spirit, the law creates in the sinner a need for the grace (gospel) of Christ. By pointing out what is right, what is good, what is true, those who fall short of that standard (which is all of us) realize our need of salvation. In this sense the law points us to the need for the gospel, the need of grace. This grace comes to us through Jesus. The function of the law, even in the Old Testament, was to show us our need of salvation; it was never a means of providing that salvation. “It is a further error to argue that the writer of Hebrews (10:1-4) corrected the law, as if it had taught that ‘the blood of bulls and goats [could] take away sins.’... The sacrifices were pictures, types, and models of the one perfect sacrifice that was to come.” - Walter C. Kaiser, Five Views on Law and Gospel (Mich.: Zondervan, 1993), pp. 394, 395. Look around at what violation of God’s law has done to humanity. How has your own life been impacted by the violation of God’s law? What does your answer tell you about just how relevant the law remains? As we saw in Monday’s lesson, many Christians still believe in the binding nature of God’s law. Again, as long as one accepts the reality of sin, it’s hard to see how anyone could believe anything else. Yet, as we know so well, the whole issue of the Christian obligation to the law suddenly gets very murky when the question of obedience to the fourth commandment arises, particularly in regard to the seventh-day itself. In fact, the irony is that the Alabama judge who got himself in trouble for his insistence on placing the Ten Commandments monument in the courtroom, was himself living in violation of that law because, however strict a Sunday keeper he might have been, he wasn’t keeping the biblical commandment to rest on the seventh day. If we take the Bible for what it says, then according to James - “For whosoever shall keep the whole law, and yet offend in one point, he is guilty of all” (James 2:10) - then the judge was guilty of violating every precept of the law that he insisted upon leaving in the courthouse! Exodus 20:9-10 explains the Sabbath commandment. The text is careful to point out when the Sabbath occurs (the seventh day), and how it is to be kept (cessation of regular work by all under one’s shelter) in order for its holiness to be guarded. “The Sabbath is not portrayed as a day of recuperation from those too weak to keep working day after day without rest. It is portrayed rather as a stoppage good for everyone, for the purpose of refocusing on holiness (all concerns that stem from belonging to God, which is what holiness is) in order to enjoy God’s blessings of that day and its potential.” - Douglas K. Stuart, The New American Commentary, Exodus, vol. 2 (Broadman & Holman Publishers, 2006), p. 460. The spiritual potential of the Sabbath is embodied in what it symbolizes. What do the following texts tell us about the spiritual meaning of the Sabbath? How has your own experience with the Sabbath helped you to better appreciate what these texts teach us? Exod. 20:11; Deut. 5:15; Exod. 31:13; Ezek. 20:20; Heb. 4:3-9. In the final question of yesterday’s lesson, we looked at both Exodus 20:11-12 and Deuteronomy 5:15. What we see here is the Sabbath pointing us toward two ideas: Creation and Redemption, two concepts that are very powerfully linked in the Bible. God is not only our Creator, He is also our Redeemer; and both these important spiritual truths are brought home to us every week, every seventh day, as we rest on the Sabbath, “according to the commandment” (Luke 23:56, NKJV), just as the women who “came with Him [Jesus] from Galilee” (Luke 23:55) did. Read Colossians 1:14-16 and John 1:1-14. How do these texts link Jesus as both our Creator and Redeemer? “Since the divine law is as sacred as God Himself, only one equal with God could make atonement for its transgression. None but Christ could redeem fallen man from the curse of the law, and bring him again into harmony with Heaven.” - Ellen G. White, God’s Amazing Grace, p. 42. Only as Creator, only as One equal with God, only as the One who had made “all . . . that was made” (John 1:3), could Jesus be the One to redeem fallen humanity. By pointing us to Christ as our Creator and Redeemer, the Sabbath is a powerful symbol of the gospel of grace. In fact, our resting on the Sabbath reveals that we, indeed, are not saved by the works of the law but by what Christ has done for us. Thus, Sabbath rest becomes a symbol of the rest we have in Jesus (see Heb. 4:3-9). Salvation, too, is restoration; it is re-creation, a process that not only starts now when we have accepted Jesus (see 2 Cor. 5:17, Gal 6:15) but that culminates and climaxes with the re-creation of the heavens and the earth (see Isa. 65:17, Rev. 21:5). These verses show even more clearly how Creation and Redemption are linked and both these crucial truths are embodied in the Sabbath commandment, one of the Ten Commandments. It’s one thing to say that you are a Sabbath keeper, and to even rest on the Sabbath. The scribes and Pharisees did that. But it’s another to experience the fullness and richness of the Sabbath. What about your own Sabbath keeping? What might you do in order to better reap the spiritual and physical blessings that God provides for us on the Sabbath day? Read Ellen G. White, pp. 140-146, in A Solemn Appeal; “God’s Law Immutable,” pp. 433-450, in The Great Controversy. “God would have us realize that He has a right to mind, soul, body, and spirit - to all that we possess. We are His by creation and by redemption. As our Creator, He claims our entire service. As our Redeemer, He has a claim of love as well as of right - of love without a parallel. . . . Our bodies, our souls, our lives, are His, not only because they are His free gift, but because He constantly supplies us with His benefits, and gives us strength to use our faculties. . . .” - Ellen G. White, God’s Amazing Grace, p. 245. “And the Lord says, ‘If thou turn away thy foot from the Sabbath, from doing thy pleasure on My holy day; and call the Sabbath a delight, the holy of the Lord, honorable; . . . then shalt thou delight thyself in the Lord.’ Isa. 58:13-14. To all who receive the Sabbath as a sign of Christ's creative and redeeming power, it will be a delight. Seeing Christ in it, they delight themselves in Him. The Sabbath points them to the works of creation as an evidence of His mighty power in redemption. While it calls to mind the lost peace of Eden, it tells of peace restored through the Saviour. And every object in nature repeats His invitation, ‘Come unto Me, all ye that labor and are heavy-laden, and I will give you rest.’ Matt. 11:28.” - Ellen G. White, The Desire of Ages, p. 289. Jeremiah 31:33 reads: “But this shall be the covenant that I will make with the house of Israel; after those days, saith the Lord, I will put my law in their inward parts, and write it in their hearts; and will be their God, and they shall be my people.” Some try to use this text to show that the law (or, really, the seventh-day Sabbath) has been abrogated under the new covenant. What’s wrong with that line of reasoning? In fact, in what ways does this text reinforce the Seventh-day Adventist position regarding the law, including the Sabbath? Because we do believe that the law, including the Sabbath, should be kept, why must we be careful of falling into the trap of legalism? In class, talk about what legalism is and how we can avoid it. Think through the role of the law in the great controversy. Why, in his attack on God’s law, has Satan singled out the Sabbath commandment for special attention? Why was that such a 'brilliant' move on his part? I'm a young single young adult, and I live with my parents. Recently some Adventists held meetings in my neighborhood in Nairobi, Kenya. I heard some young people talking about the meetings. They said that I could hear some good preaching and see movies about Jesus. I decided to go. The pastor's message touched my heart. I decided to go again the next day, and again I was blessed. I wanted to talk to the pastor who had spoken, but he and a group of others were on their way to a meeting with the youth. So I went with them. What a blessing I received! I told my parents that I was attending the Adventist meetings, and they weren't happy about it. They told me that I shouldn't have gone there. I explained that I felt God's presence there and had to listen to the message so I could decide for myself the way to salvation. The next day I told the pastor that my parents weren't happy that I was attending the meetings; he prayed for me. I continued attending the meetings. I decided to stay with an Adventist family for a few days so that I could learn more about what Adventists believe. Then one night I saw my parents attending the meeting. I greeted them, and they seemed happy to see me. I told them that I wanted to join the Adventist Church because I had been studying the Bible and realized that these Christians taught the truth. They agreed, and I returned home with them. Not only did they allow me to continue attending the meetings, but they attended with me. I thank God that I am now a believer. Praise God that my parents allowed me to go to the meetings. I have been baptized, and my precious parents are preparing for baptism. I know that it was the prayers I prayed as well as those who prayed with me that touched my parents' hearts. I thank God for the people who sacrifice their time and give their offerings so that others, such as my parents and me, can know the truth. I urge young people to keep on praying, for He will do something powerful in their lives. 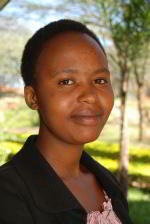 Brenda Mwende shares her faith in central Kenya.